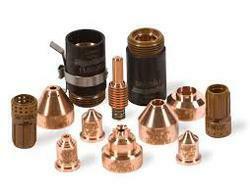 Hypertherma Plasma Torch parts,Hypertherm Plasma consumables, Hypertherm Plasma Consumables powermax 45,65,85,105. Guaranteed Best price for Hypertherm Plasma consumables. Customers can easily avail from us this high quality range of Hypertherm Genuine Consumables.The offered range has been widely appreciated for its optimum features of dimensional accuracy and sturdiness. Customers are offered this range at the most comprehensive and market leading price range. Looking for Hypertherm Powermax Consumables ?